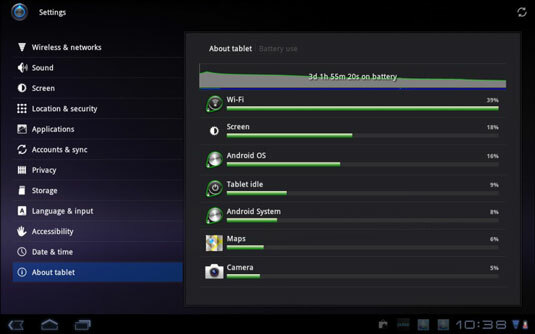 Perhaps the most important item you can monitor and maintain on your Galaxy Tab is its battery. The battery supplies the necessary electrical juice by which the device operates. Without battery power, your Tab is basically an expensive trivet. Keep an eye on the battery. The number and variety of items listed on the Battery Use screen depend on what you’ve been doing between charges and how many apps you’re using. Carefully note which applications consume the most battery power. You can curb your use of these programs to conserve juice — though, honestly, your savings are negligible. No feature can control power management on the Galaxy Tab. A future update of the Android operating system may offer this type of management, in which case you can control how the Galaxy Tab uses power, set timeouts, and adjust power-saving features.